With the exception of those who work with hard media like wood, clay, or paint, a strange thing has happened to artists and makers in the digital era: We’ve stopped getting our hands dirty as much. Designers work largely on tablets, not drafting tables. Photographers swap SD cards, not film, and do post-processing hunched over a screen, not developing fluids. 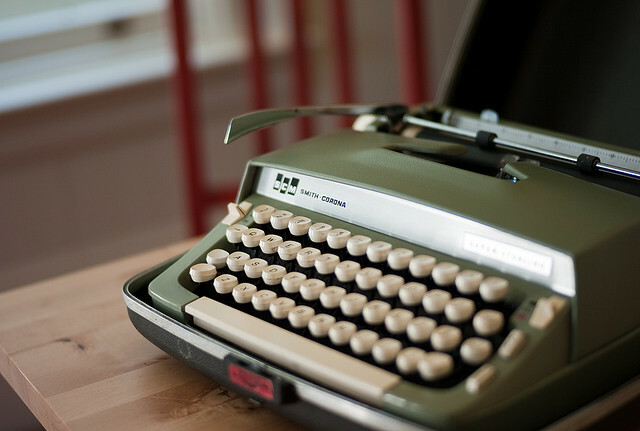 Writers tap away at keyboards, rather than smudgy typewriters or leaky pens. 3D printers have even made it so that instead of constructing artifacts out of, say, wood, we can make them from polymer with barely any touching involved. Or at least, that’s what we’ve been doing most of the time since all of those cool new technologies have come along. But to say that artists and makers and doers have abandoned those tactile, physical, analog methods of creativity is an outright lie. We’re still shooting with real film. We’re buying up old typewriters. Our bosses are even putting in literal drawing rooms and other creative spaces designed for the sole purpose of giving us something to do with our hands. Most of us take notes in notebooks (and salivate over anything that seamlessly blends analog with digital. See: the Hanx Writer app and the new Moleskine that is basically an iPad made of paper). In short, creative people are still feeding that inclination to touch stuff, to make things with their hands, to actually build and move and futz with things. But why? Why, in the age when we can get away with touching almost nothing save for computer screens and keyboards, are we still so eager to draw, doodle, pain, sketch, graph, write, and build things with our hands? Essentially, it’s because our brain is wired to. Tactile learning and doing (like drawing, doodling, and writing) has been found time and again to boost creativity and productivity, but it also helps aid in retention of information, in part because incorporating our body with our brain can help us remember things better by creating prompts and shortcuts. Which means that making that to-do list on paper is not only a good way to ensure that you have a visual reminder of what you need to get done, but also helps code the list into your brain a little harder, because you took the time to write it out. Doing things with our hands also feeds into the need for your brain to idle sometimes. It’s why we come up with our best ideas while driving, or showering, or gardening — by allowing ourselves to just sit and concentrate on a task that’s largely physical but not extremely mentally taxing, we’re letting our brain work through things on its own. The end result: More creative solutions to problems, more ideas about new projects, and more ways to approach our work. On his blog, author and artist Austin Kleon notes that he keeps a legal pad nearby at all times, to help him regain focus. There’s also something about the novelty of analog. It’s why the sale of vinyl records has been increasing hand over fist; as much as digitized music has made our lives easier, it’s also taken away some of the fun factor of unwrapping a record, turning it over, and reading the liner notes. The same is true with books — especially in the fashion world, where tactile materials continue to rule. Sure, we’ve all got iPads and Kindles, but there’s sometime inescapably enjoyable about actually turning pages. And the fact that we have a choice in the matter seems to really appeal to creative people. Digital progress has certainly made our lives easier and more interconnected — sharing files, creating neat-looking work, allowing us to communicate with other thinkers and creatives around the world, and even pursuing out dream jobs would not be possible without the myriad advances of technology — but until we no longer have the sensation of touch and the compulsion to do things with our own hands, creative people will continue to search for and invent new ways to incorporate the new innovations with old-school mainstays. And when iPad apps that act like typewriters don’t do the trick, we’ll probably just keep turning back to a pen and a scratch pad because, well, we’re kind of built for it. 6 Typography Terms That Get Confused. A Lot. Should You Really ‘Write Drunk, Edit Sober’? Caffeine: Friend or Foe of Creativity?